Made from a grease injector, wood, a rubber sleeve, and tape. 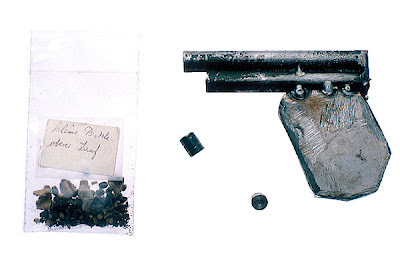 The mock weapon was found in 1994 in a prison workshop in Wolfenbüttel prison, Germany, after jailers were tipped off that an escape attempt was being planned. 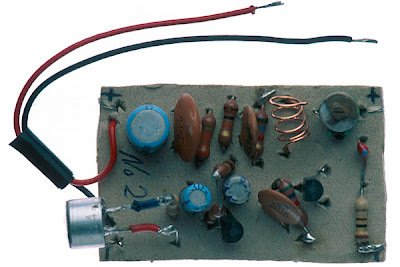 Made of radio recorder parts by an inmate of Wolfenbüttel prison, Germany (battery is missing). Prisoners occasionally manage to install gizmos like this one in guard-rooms to be prepared for upcoming cell searches. Also suitable as a means of cell-to-cell communication among inmates. A standard radio serves as a receiver. 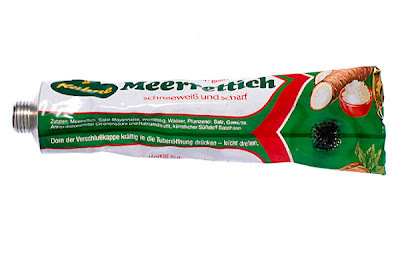 Fashioned from an empty horseradish tube; confiscated in ‘Santa Fu’ prison in Hamburg, Germany. Bongs are the most common of all forbidden items in prisons. The range of materials they are made of mirrors the inmates’ great imagination. And their prior needs. 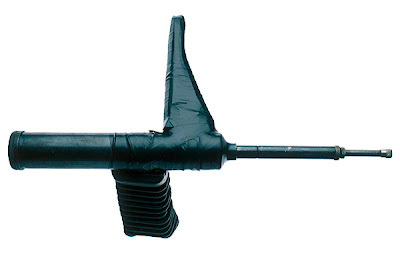 With a padded handle, this weapon is made from a rasp that was presumably stolen from a prison workshop. 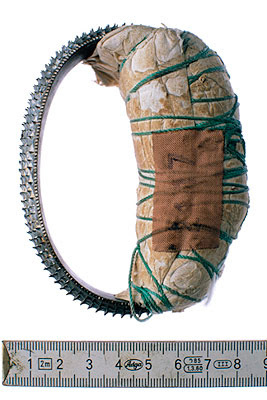 The weapon was found in a cell in the prison of Wolfenbüttel, Germany, sometime around 1993. 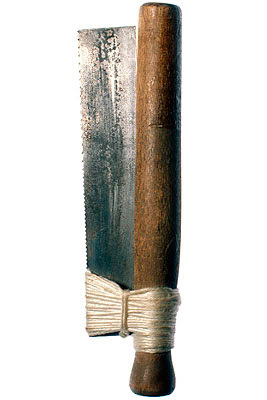 An inmate of ‘Santa Fu’ prison in Hamburg, Germany, fitted a wooden handle to a piece of saw blade for better handling. The tool was found in his cell and confiscated. Made from from blackened cardboard; found on June 23, 1988, in an inmate’s cell in Stammheim prison, Germany, after a fellow prisoner tipped off the jailers. The dummy was hidden in an empty milk pack and was most probably intended to be used for taking hostages in an escape attempt. 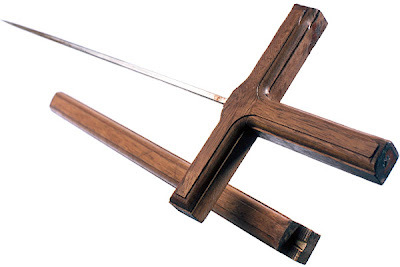 Disguised as a wooden crucifix, this dagger was found in an inmate’s cell in Wolfenbüttel prison, Germany, sometime around 1994; intended for use in an escape or as a general weapon. At that time a lot of crucifixes were fashioned in prison woodshops until jailers finally dug their true purpose. Made with segmented extension rods (13 segments, overall length: 4.5 meters) and rope made of leather and string. 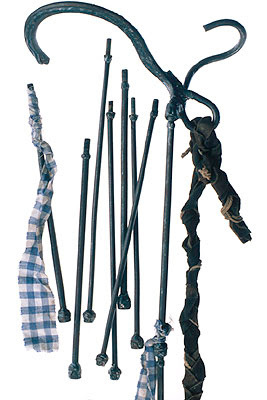 This cleverly conceived tool assisted two inmates in their escape from Ludwigsburg prison, Germany, on August 19, 1987. The attached rod enabled them to place and retrieve the hook and thus negotiate two prison walls in succession. 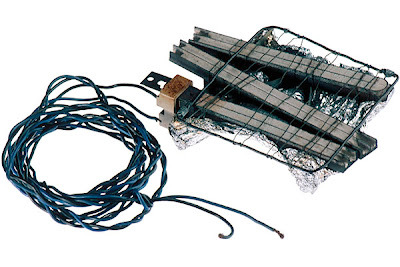 An inmate of Ludwigsburg prison, Germany, botched together this multi-purpose tool from wire, a broken heating rod and some tin foil. It was found in his cell and confiscated sometime in the mid-eighties. IF YOU WANT TO DISCUSS PURE RESOURCEFULNESS, INNOVATION AND CREATIVITY, a good place to start is the worldwide penal system. Yep. Prisons. There, restricted of materials and allowed only a few approved “safe” items, prisoners have nothing but time on their hands to devise the most ingenious “unapproved objects.” Of course, many incarcerated people turn their time to making art—carving (soap, wood, stone), drawing, painting, folding paper or other— is better known. Less known are the “other” things prisoners use to defeat the system (as I am showing above). 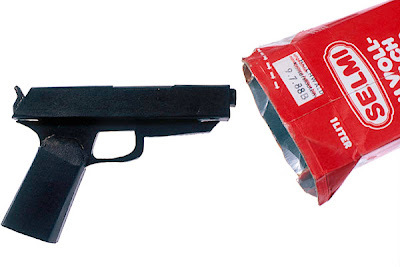 All of the above items were photographed more than 10 years ago by award-winning German photographer Marc Steinmetz, who has a most interesting Web site of his work. Steinmetz is a pro, having photographed for major corporations and educational institutions in the areas of science and technology, industry, museums and more. Check him out by clicking here. 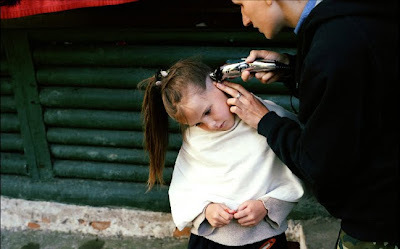 All images © Mark Steinmetz. All photos on this post © Guillaume Herbaut. IN THE UKRAINE, A COUNTRY WHERE FEMALES ARE VICTIMS OF SEXUAL TRAFFICKING AND GENDER OPPRESSION, a new tribe of empowered women is emerging. Calling themselves the “Asgarda,” the women seek complete autonomy from men. 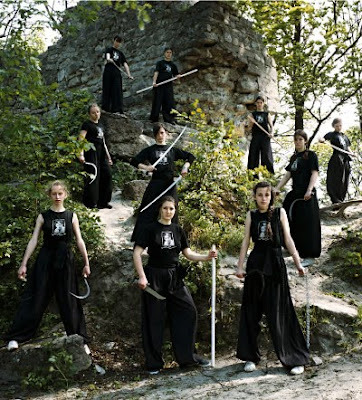 Residing in the Carpathian Mountains, the tribe is comprised of 150 women of varying ages, primarily students, led by 30 year-old Katerina Tarnouska. 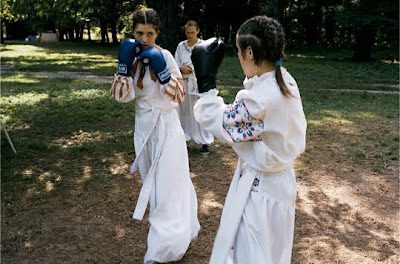 Reviving the tribal traditions of the Scythian Amazons of ancient Greek mythology, the Asgarda train in martial arts, taught by former Soviet karate master, Volodymyr Stepanovytch, and learn life skills and sciences in order to become ideal women. 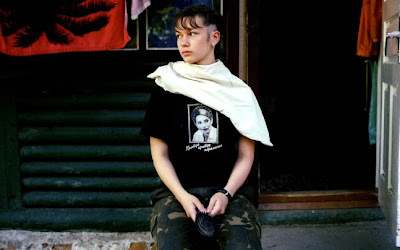 Little physical documentation existed on the tribe, until recently, when renowned French photographer, Guillaume Herbaut, met the Asgarda back in 2004 in the midst of the Orange Revolution. 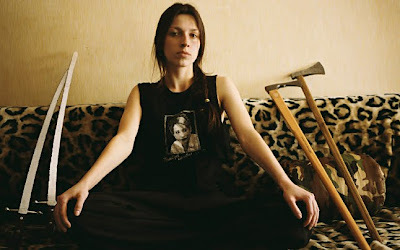 Finding their involvement with the revolution intriguing, Herbaut spent fourteen days photographing the tribe for “Le Retour des Amazones.” As apparent in several of the photos, the Asgarda idolize Yulia Volodymyrivna Tymoshenko – a key figure in the Orange Revolution and leader of the “Fatherland” party. 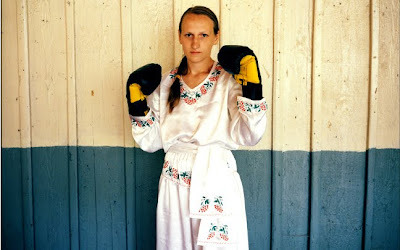 Hoping to convey “the tradition, the legend, and the uneasiness among women in Ukraine”, Herbaut’s photographs portray devout and austere females in traditional and newfangled garb brandishing braids, battle axes, and boxing gloves. While Herbaut is uncertain if the photos are a good representation of the tribe, he adds “They were very happy when they saw the pictures. 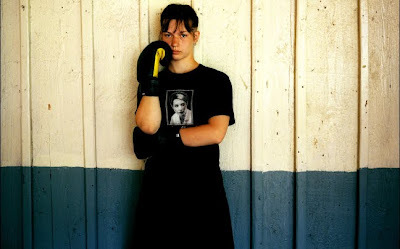 They want to show their strength.” When asked of his impressions of the Asgarda prior to and after photographing them, he remarked, “My first impression was ‘Asgarda is the root of a new sect’. My second impression was ‘Asgarda is the root of a new sect’!” New sect or the rebirth of a previous one, the Asgarda are reclaiming their lost independence, and, if Herbaut’s photographs are any indication, they aren’t afraid to fight for it. This article was written by Jenna Martin, for PlanetMagazine. All photos are by and © Guillaume Herbaut. This post via PlanetMagazine.